Accord/Stone Ridge rental, charming yet modern house with land, bluestone patio, stone grill and porch. Waterfalls with goldfish pool and hammock nearby. On 20 acres with pond access. Professionally designed and landscaped. Adjacent to woods. 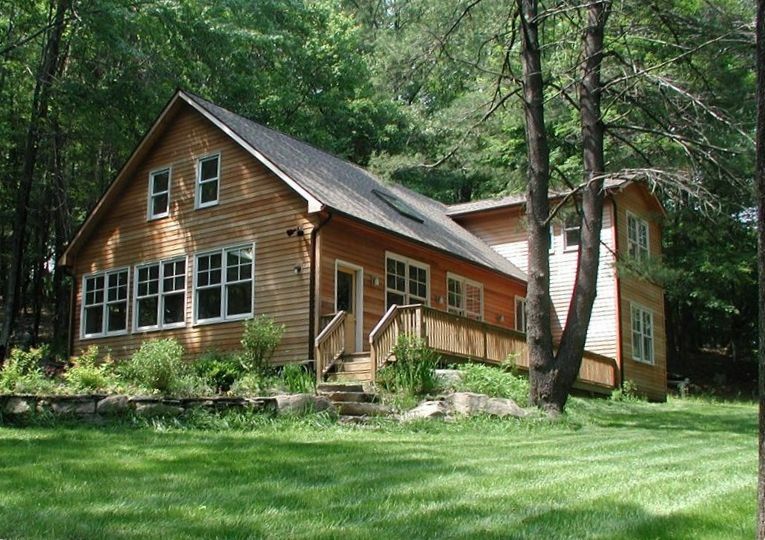 Located between Woodstock and New Paltz, close to skiing,national parks, trails swimming and the Mohonk House. New construction, hardwood and marble/slate floors, clean and flooded with light. It includes two skylights. One master bedroom and two other bedrooms, two baths, computer niche, game room. It can sleep up to eight guests. Ping Pong table is available (optional). One of a kind mosaics and artisan tile work. Nearly all new beds. Living room has high ceiling. Nice layout for entertaining and perfect acoustics for musician. Off quiet road, however, within six minutes to town center and shopping. Adjacent to the historic village of Kripplebush where there is a local museum. Hiking trails on land. One bikes available. Children's swing set out back. The house is well situated in a rural setting but with easy access to groceries and other towns offering cultural events- plays, performances, exhibitions. It is also close to nature reserves, the Shawangunk Ridge, Mohonk preserve and Catskill park. The property has acreage and nice paths as well as water and outdoor patios and a fire pit and grill. The house also has a piano. Beautiful property in the woods not far from quaint towns and shopping. The house is just as described, and the hosts are very helpful and close by. My family had a great time at Tracey's house! The house itself is very comfortable, the property is gorgeous (including, especially the pond!) and the area is also great. Hope to return! Lovely, well-kept cabin with lots of space for socializing and relaxing. Thanks for a wonderful weekend. Kathleen and her party were friendly and left the house immaculate! Best guests ever. Absolutely loved the location and the property. Would come again. We had such an amazing weekend here. Tracey and her husband are wonderful hosts. The accommodations are very nice, well kept and up to date with plenty of upgrades. Would love to come again. My boyfriend and I had the pleasure of staying in this beautiful cabin during a weekend getaway from New York City this fall. Everything about the cabin was perfect, the calming environment surrounded by woods, the lovely outdoor tables and chairs, the backyard waterfall, not to mention every indoor amenity you could ask for, including a ping pong table! We walked around the pond, enjoyed the lovely changing colors of the leaves, and read and relaxed inside the cozy cabin. The owners couldn't have been more welcoming and helpful. I can't wait to return for another weekend getaway!